The biggest and best band to come out of Switzerland, Krokus formed and debuted on New Year’s Eve 1975. Their breakthrough came in early 1980 when the album “Metal Rendez-Vous” was officially distributed outside their home country and it quickly became the band’s first Gold album. During that year Krokus embarked on their first US tour with the likes of Sammy Hagar, Cheap Trick and AC/DC. During the late eighties, after success in the States and the UK and several best-selling releases (including “Hardware” and “Headhunter”) long-term touring and recording took its toll. After a final US tour in 1988 founder member Fernando von Arb left and the various band members went on to embark on various solo projects. 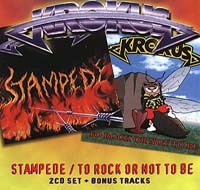 During this period, von Arb formed a new version of Krokus and in 1990 this line-up recorded “Stampede” one of the two CDs featured here. In 1994 Krokus continued with members from their classic line-up and released “To Rock or Not To Be”, the second CD included in this double Angel Air presentation. Five years on, in 1999, will see the band gigging again in the UK and making plans for a new album.